Liam wanted to commission a special pendant to give to his fiancé on their wedding day. 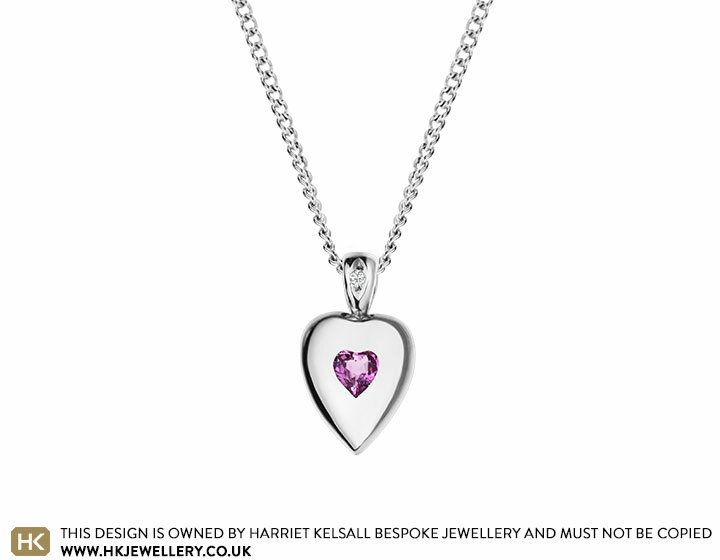 The simple 9 carat white gold heart shaped pendant has been set with a 0.29ct heart cut pink sapphire and features a 1.2mm round brilliant cut diamond in the bail. The pendant is rounded at the edges to fully showcase the shape of the heart and it has been polished and rhodium plated to achieve a bright white colour. This chain was created in our workshop as a previous one-off commission. We'd be delighted to give you an estimate for your own unique chain based on this design.